Last month, the European Space Agency landed on a comet 300 million miles away to take samples that could help unravel our solar system's origins. It turns out there are pieces of comets closer to home, too. 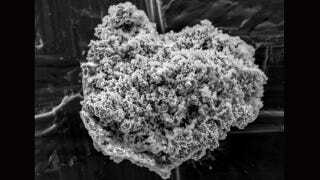 Scientists have just found comet dust preserved in the frozen reaches of Antarctica. Why the big hoopla over comets? These lumps of ice and rock are some of the most primitive things in space; they're like time capsules from the early days of our solar system. Knowing the chemical composition of comets will provide clues into all sorts of historical mysteries, such as whether comets that crashed into the Earth helped seed the water and organic molecules that made life possible. Trouble is, comet samples are hard to come by. Landing on a comet is, unfortunately, a once a generation kind of mission. More routinely, scientists collect "chondritic porous interplanetary dust particles," or comet dust by plane, flying in the stratosphere with plates coated in silicon oil. It's pretty inefficient. "Several hours of flying time typically yield one particle of dust," notes Science. The discovery of comet dust preserved in Antarctica promises an entirely new source of this precious material. Researchers based at Kyushu University melted ice and snow samples from two sites in Antarctica and ended up with more than 40 particles of comet dust. According to Science, another team had found unusually dense comet particles in Antarctica in 2010, but the scientists never expected typical comet dust, which is fragile and porous, to survive on Earth.